There are two types of people in this world: those who think Alfa Romeo Giulietta Sprint Speciales are beautiful and those who should think Sprint Speciales are beautiful. It’s hardly an infallible argument but we are sticking to it — especially after spending a few minutes staring at this amazing original Alfa. Admittedly you don’t have to think the Sprint Speciale is beautiful to appreciate the BAT in all of its glory. The product of a Bertone challenge to Zagato’s pre-existing design, the Sprint Special was a slippery stunner when the concept was revealed to the world in 1957. Interestingly the drag coefficient of the Alfa was so low, it took over two decades for another car to match it. Unfortunately the Sprint Speciale never quite lived up to the lighter Zagato body style on the race track–even when lightened with an aluminum body. While this Sprint Speciale is not one of the very rare aluminum body cars, it is in its own way a very rare example of an already rare car. At first glance you might think this Alfa has been meticulously restored, but a closer inspection reveals that this car is actually an unbelievably kept original car. Having traveled only 49,726 miles from new this car has the original interior, engine and all other major mechanical components–right down to the original set of keys. This particular “Alfa Red” car also has a bit of interesting history to go along with it. After being built in Italy this Sprint Speciale was flown (rather than freight shipped) to the United States. Upon arrival this car is believed to have been Alfa’s show car in 1961 for the New York, Chicago and Los Angeles Motor Shows although it cannot be confirmed. Show car or not, this Sprint Speciale is an amazingly original and rare little Alfa that we’re sure someone will be extremely proud to own. Bidding on the Sprint Speciale is currently at $99,000 with the reserve not yet met and a day left on the auction. 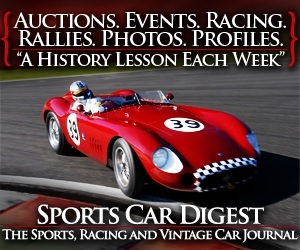 Find this 1961 Alfa-Romeo Giulietta Sprint Speciale on eBay here.